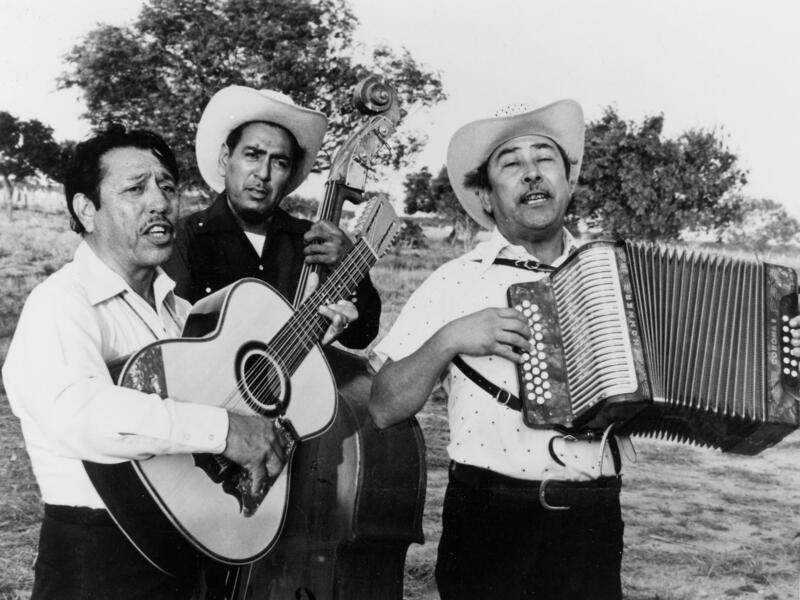 Legendary norteño group Los Alegres de Terán, in a promotional still from the 1976 documentary Chulas Fronteras. On the 76th birthday of Flaco Jimenez — one of the instrument's most celebrated living players — Morning Edition asks how the accordion-heavy folk music of northern Mexico came to sound so much like the polkas and waltzes of Eastern Europe. Hear the conversation, featuring Felix Contreras of NPR's Alt.Latino and Chris Strachwitz of Arhoolie Records, at the audio link. You're listing to the music of a Texas musical icon, accordionist Flaco Jimenez. He turned 76 today. And to celebrate, we're going to talk for the next few minutes about the kind of music he plays. It has its roots in Mexico and in Eastern European waltzes and polkas, like this. MONTAGNE: To explain how these two styles of music blended together, we called on a man who knows a thing or two about cultural mash ups. He's Felix Contreras, host of NPR music's Alt.Latino, a podcast that explores the intersection of traditional and contemporary Latin music. Good morning. FELIX CONTRERAS, BYLINE: Hey, Renee. MONTAGNE: Talk us through how waltzes and polkas became Mexican music. CONTRERAS: It's largely a story of immigration. OK, so in the late 19th century, there was this influx of Germans and people from what is now the Czech Republic. They all came and immigrated to northern Mexico and south Texas. And they brought two different cultural staples with them. One of them was the accordion. Now, in the first part of the 20th century, there were still traditional Eastern European orchestras playing music from the old country. And here is music from Czechoslovakia. This is called "Circling Pigeon Waltz" by the Patek Family Orchestra of Shiner, Texas. CONTRERAS: OK. Now, juxtapose that, another waltz called "Lucita" by Tejano music pioneer Narciso Martinez. This one was recorded in the 1930s. CONTRERAS: What you're hearing rhythmically is pretty much the same - one, two, three - one, two, three. A waltz is a waltz is a waltz, right? Musically, what Narciso Martinez and a few others did was fill in the horn parts of the Czech orchestras - the tubas, the saxophones, the trumpets - with the various buttons on the button accordion. And it's especially true with that um-pa-pa, um-pa-pa (ph) of the tubas and the waltz - the signature sound of the waltz. MONTAGNE: And at what point and under what circumstances did these cultures start to blend? CONTRERAS: You know what? While there was a musical mashup, socially it was a little different. There was a lot of racial tension between the Mexican and the Mexican-American community in this part of the country and everyone else. Now, the music wasn't born from Mexican and Eastern European jam sessions. More often than not, it was learned at a distance. Now, we heard from Narciso Martinez just now. He's considered by musicians and historians to be the father conjunto music, the father of this accordion-driven music. Many of his historic recordings were collected by the folk label Arhoolie Records. Chris Strachwitz is the founder of Arhoolie, and he once asked Martinez exactly how was it that a young Mexican-American accordion player from rural Texas came to learn how to play all these Eastern European dance songs? CHRIS STRACHWITZ: So he said, OK, Chris, I'll tell you a little story. When I was young, me and my buddy would listen to those German bands. When we got home, my buddy would whistle these tunes to me. And I would pick them up on the accordion. CONTRERAS: Very simple process, but that is basically the roots of how all of this music came together. MONTAGNE: Well, story for another day. But thank you for joining us once again. CONTRERAS: Thank you so much. MONTAGNE: Felix Contreras is host of Alt.Latino. Transcript provided by NPR, Copyright NPR.